Emerald Lake Redux. Flickr.com. Jason Barnes. Photo taken: 5/30/2010. The Center for Biological Diversity and Food & Water Watch today filed a notice of intent to sue JBS USA and the Swift Beef Company for illegally dumping slaughterhouse pollution into Colorado waterways, putting people and wildlife in danger and violating the Clean Water Act. Read the Press Release HERE. Call for Abstracts: The Rocky Mountain Chapter of the Society of Wetland Scientists will partner with the Colorado Riparian Association for their annual meeting on April 10, 2019. They are now accepting abstracts for 15 to 20-minute oral presentations on any wetland or riparian related projects, research, management, education, or other similar work. Presentations related to topics that affect wetlands and riparian habitat within the Rocky Mountain Chapter are preferred. Please go the WEBSITE and submit your abstract by February 22, 2019. 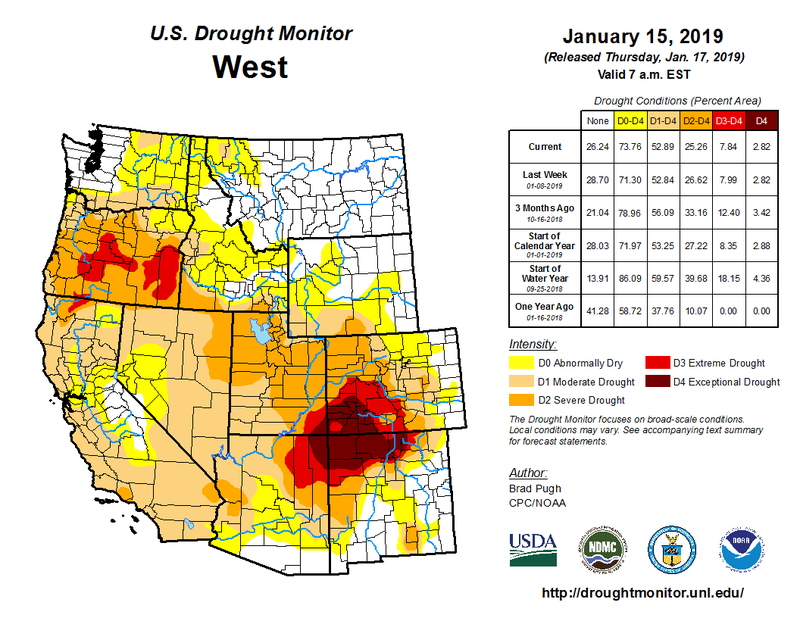 The January 2019 Drought Update, a summary of the drought information presented at the January 22, 2019 Water Availability Task Force Meeting, will be posted on the CWCB website. All of the presentations from the meeting can also be found on the CWCB website. If you have questions regarding the Drought Update, please contact Taryn Finnessey at taryn.finnessey@state.co.us. U.S. Drought Monitor released a snapshot MAP of broad-scale conditions. The Colorado Water Quality Control Commission consists of nine members with staggered 3-year terms. Commission members are appointed by the Governor, subject to confirmation by the Colorado Senate. The following members’ terms expire February 15, 2018: Barbara Biggs (finishing her second term), Fred Menzer (finishing his first term) and Kevin Greer (finishing his first term). While the governor may or may not reappoint some of these commissioners, applications are being accepted from anyone interested in serving on the commission. For more information, and application, click HERE. High school students at Arvada West High School are interested in job shadowing at water organizations. It would be a three-week run with the students. They seek a wide range of experiences while pursuing a water degree. Please contact Cheslea.Campbell@rrcc.edu, the Faculty Lead of Water Quality Management Technology at Red Rocks Community College. The Watershed Planning Toolbox is a comprehensive resource for incorporating wetlands and streams into watershed planning, restoring wetlands to improve watershed health, and identifying opportunities for wetland conservation. Many Toolbox data layers have statewide coverage, while some more detailed layers for wetland functions and priority conservation and restoration are building out from the Arkansas and South Platte Headwaters Project Area. The Toolbox includes an interactive mapping platform that allows users to view wetlands, streams, likely aquatic ecosystem functions, ecological stressors, and high-priority sites for conservation and restoration at the landscape scale. Along with geospatial data, the Toolbox includes a gateway to a variety of other restoration and conservation resources via the Working in Wetlands web pages.